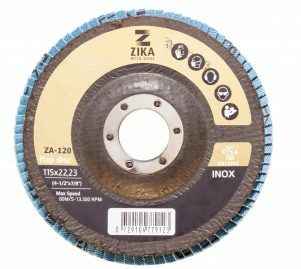 Flap Discs – Zika Industries Ltd.
Home Catalog Abrasive Products Flap Discs – Zika Industries Ltd. Application: Grinding, stock removal, edge chamfering/beveling, weld blending, deburring/deflashing, rust removal, blending, cleaning and finishing. Maximum working speed: 80 m/s. Grain type: Zirconia Alumina – Offers extremely high mechanical strength. The ZA flap discs are ideal for aggressive stock removal and faster cutting on flats and contours.